I grew these in a mix from Grand Teton a couple years ago, they were good! So I planted a 50' row of them this year from The Maine Potato Lady. Most of them look like ginger root... What would cause this? 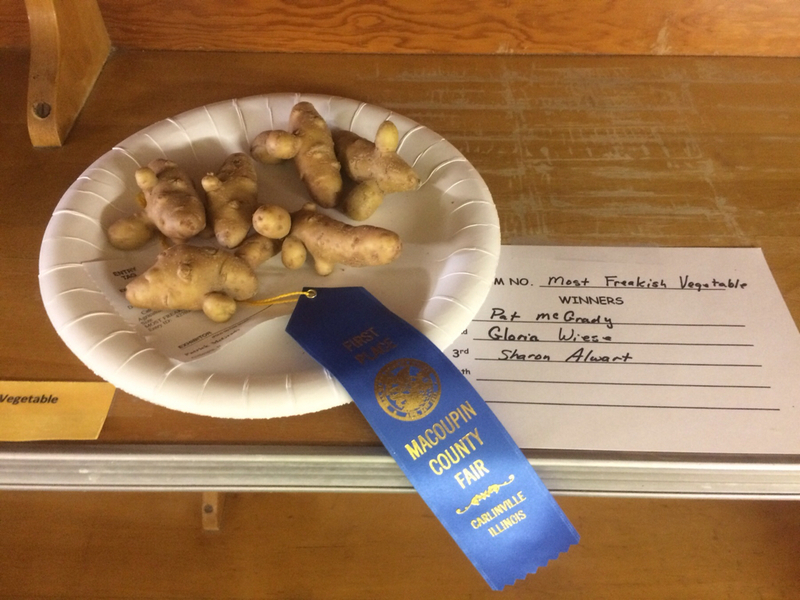 On another note I also won 1st place with them at the county fair for most Freakish Vegatable! Location: Back in da U.P. they got finns on dem der potatoes. At least you got first prize! Are you growing in sandy or fluffy loam, or something heavier? I've had fingerlings grow like that and thought it a consequence of my heavy clay soil, but glad to hear other insights. Soil is what I would call fluffy, and wasn't compacted (easy digging). I had rows of French fingerling, banana, a fingerling mix and magic molly growing next to them and none of them grew like this. Then those are just downright weird! I see this quite a bit with potatoes that are not commercial 'standard' types. Usually this is due to environmental factors and the plants were stressed with heat, drought, or something like that. Commercial types are not usually as susceptible with things like this because they breed against susceptibility for this, as tubers that look like this are usually not deemed marketable. 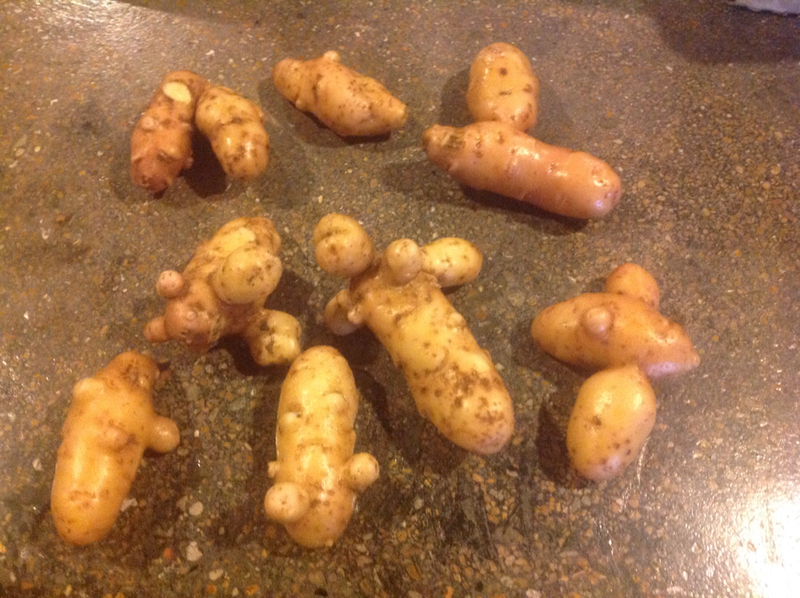 Some older heirloom varieties, especially fingerlings, can look like this. The trait is called a lack of apical dominance, meaning it sprouts from places other than the growing end of the tuber. Commercial tubers are bred to have apical dominance. Closer to the original potatoes. We are so used to seeing modern bred potatoes we forget what the originals looked like. They are the ones involved in the potato famine I have read. Don’t need an Irish Potato Famine in my garden. Just read the National Geographic on that potato, sounds like they don’t taste very good compared to modern day potatoes. Irish lumpers and several others ( Kerr's Pink comes to mind) are best boiled about half done, then tip 1/2 or more of the water out and finish by steaming them. They taste very very good this way with a nice bit of butter. They are cooked in the skins this way, not peeled, and the potato is fluffy in texture, aka "floury" it's called in GB. I'll trade my lumpers for other lumpers... PM me! Now that's taking your lumps! I put a post up here and deleted it the other day. It was about the great famine and corn laws which I know all too well about. It is a rabbit hole you can fall into and continue in many subjects and ways. Maybe I think too much but it bothers the devil out of me.